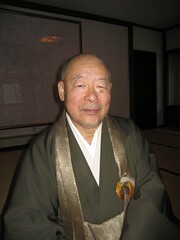 I blogged back on August 22 about the rekindled controvery with Eido Shimano, the longtime abbot of the Zen Studies Society in New York, concerning his alleged history of improper sexual relationships with students. The New York Times had a piece on it and there has been other documentation available for some time now. This is quite big news, especially within the Zen world where Eido Shimano has done a lot of harm, both to the women he allegedly had improper sexual relationships with as a teacher (NEVER, ever do that if you’re a teacher!) and for all of the men and women who looked up to him as a representative of the Dharma, an example to all. The fact is that there are a number of wonderful teachers out there who have Shimano as their teacher and preceptor, which leaves them in a very difficult position and, often it seems, at a loss as to how to properly react. I’m glad to see that he’s stepped down. I find his apology to be somewhat half-hearted and a bit overly indirect in acknowledging responsibility but at least it is done and he’s resigned. I hope for the easing of his suffering as much as all others.